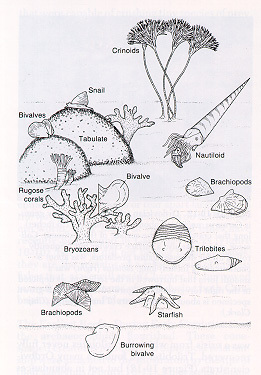 During the Ordovician Life expanded in diversity tremendously. There were extensive reef complexes in the tropics. The early Ordivician was thought to be quite warm, at least in the tropics. Despite the tremendous expansion of life during the Ordovician Period there was a devastating mass extinction of organisms at the end of the Ordovician. This extinction was perhaps the greatest mass extinction ever recorded in Earth History with overy 100 families going extinct. Why? 1. One idea was that it was the breakup and movement of the large super continent into many fragments. However, modern biology teaches us that this would not likely lead to extinctions, rather it would provide additional niche space for groups to expand into. 2. The more likely cause is that the Earth cooled, particularly the oceans where most of the organisms lived during the Ordivician (Remember there were not land plants and no evidence of land organisms yet). 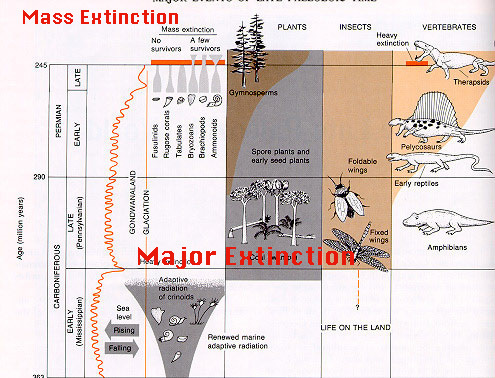 All the extinctions occurred in the oceans. The greatest extinctions occured in the tropical oceans. This makes sense since if the oceans cooled because of the development of a large ice sheet over the south polar region, the organisms adapted to warm tropical conditions would have had no where to migrate to. There would be no regions warm enough for them to migrate to. This tends to support the idea that cooling lead to many of the extinctions. Note that North Africa is located over the pole in the late Ordivician. 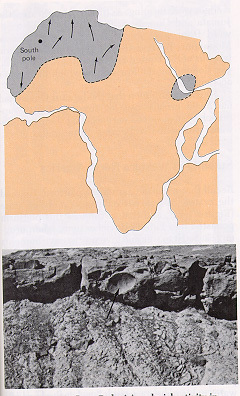 Glacial deposits of late Ordovician age were discovered there in the 1970s in Saharan Desert region. The picture shows the depression in the rocks left when a glacial boulder dropped on the soft sediment and left a depression which has been preserved for all these millions of years. 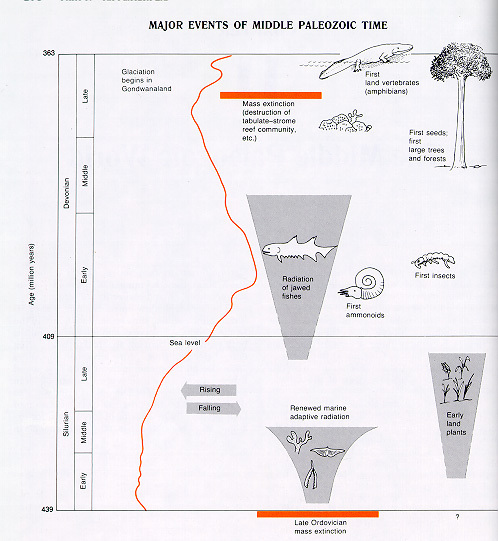 Note the expansion of life following the mass extinction at the end of the Ordovician. During the Silurian Period there was the first land plants. Marine organisms once again expanded in diversity following the extinction of so many families in the late Ordovician. 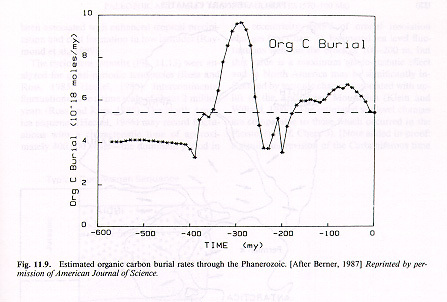 The Silurian was probably relatively warm even though pCO2 may have been lower. This is thought to be because there was no large land mass over the south polar region during the Silurian period. By the Devonian fish were a common part of the marine biological communities. Particularly important were the jawed fish. 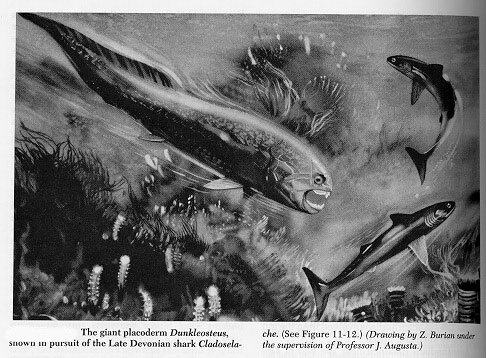 These were predators and they must have had quite an impact on the marine communites during the Devonian (see the photo below). The first fossil evidence of insects and terrestrial trees comes from Devonian age rocks. The Devonian is thought to have been quite warm. Evidence of this comes from the extensive amount of tropical-like reefs. The climate was also thought to have been quite dry. Evidence of this comes from extensive evaporite (salt deposits) that have been found dispersed much more broadly than any time in the earlier Paleozoic. See diagram below. Today, for example, evaporites are restricted to the mid latitude belt where dry sinking air from the Hadley cells make these regions dry. During the Devonian these evaporite deposites were found well beyond 30o north and south. See diagram below. 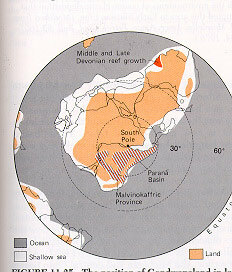 Particularly important was the position of the southern land masses (see above). 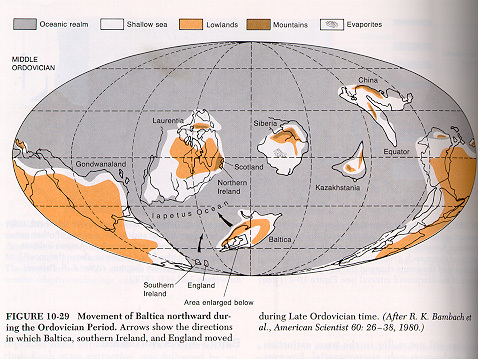 Note the location of the large continent over the south Pole by the late Devonian Period. 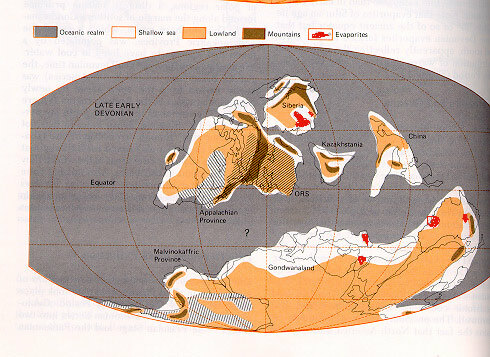 Near the end of the Devonian there was another major extinction event that affected mostly the tropical communities, especially the reefs. This extinction event has been attributed to the development of glacial conditions once again over the south polar regions and the cooling of the oceans which resulted from this glaciation. The glacial deposits have been found in northern South America which was located over the pole in the late Devonian (see diagram below). Note the location of South America over the pole. 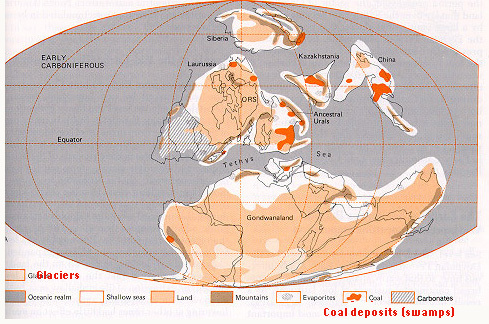 The Carboniferous and the formation of vast coal deposits. Note the expansion of life on land in the carboniferous, including early reptiles and in particular, extensive land plants in swamps. Also note that the expansion of these life forms occurred following another major extinction even in the middle carboniferous. Of particular importance in the coincidence between the expansion of vast swamps, the development of glaciations and the extinctions. Why should all of these major events coincide. Repeated glaciations and de-glaciations raised and lowered sea level causing expansion declines of swamps throughout the Carboniferous Period. The expansion of swampy wetlands with their rich plant life extracted vast amounts of CO2 from the atmosphere. Look at the diagram below which shows the amount of carbon that was extracted from the atmosphere to form coal deposits in the Carboniferous Period. There were very strong temperature contrasts between the warm tropics and the cold polar regions. This would have produce vigerous atmospheric circulation. Note the location of evaporates in the middle latitude regions in the diagram above. This is expected if the atmospheric circulation to the middle latitudes was produce strong high pressure, dry conditions where the Hadley cell descends around 30oN and South. The other important aspect to the development of evaporites is the large land mass. The larger land mass would have been much dryer on its interior since it was a long distance from the ocean. This diagram shows the effect sea level variations had on the development of repeated cycles of coal and limestone sediments during the Permian. During a transgression (sea level rise) the ocean invades the land and floods the regions before covered by rivers, streams and terrestrial sediments (coal). During a regression (Sea level falling) the ocean recedes leaving the land exposed and rivers flow once again over these exposed areas to form "Wetlands". 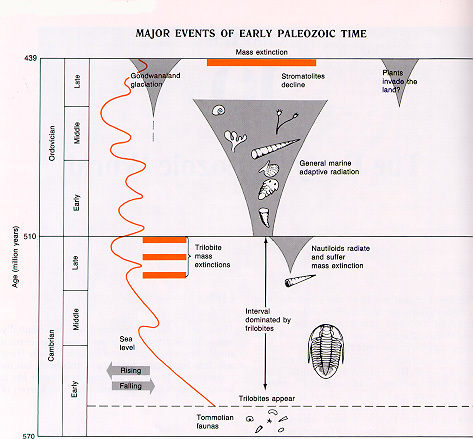 The end of the Paleozoic Era was marked by another of Earth's great mass extinction events. This was perhaps the most devastating because it affect not only organisms in the ocean but also those on land. Again cooling of the planet may be responsible for the devastating extinction. We know that that the poles were cold and the perhaps this era was the first time that glaciers formed over the north pole.